While Quantities Last SALE! BURN your own CD's! EVEN LOWER PRICE! Apple Bootable! Great for backups! Refurb tested Sony Internal CDRW ATA. These are used tested pulls from mostly G4 QuickSilver units but work fine in other models. Includes TOAST OEM THE BEST Burning Software! This unit uses the built in Apple drivers and are bootable. EASILY REPLACE YOUR EXISTING CD! These work perfectly with your Beige G3, B&W G3 & G4 Towers, G4 iMacs. THIS IS NOT A SCSI DRIVE and requires an open spot on your IDE chain. This unit has a button but it is disabled, we include software for eject. Requires 9.1 or later and is OSX compatible. Includes Toast OEM 5.2 INSTALLATION INSTRUCTIONS ON CD. Was $99.77 Lower $25 Domestic Shipping Included! FASTER MECHANISM, SAME LOW PRICE! Apple Compatible Brand New SUPERDRIVE! BURN up to DUAL Layer DVD's! The latest technology from LG at a LOW PRICE complete with IDE adapter. FASTER 24X DVD Burning, 8X Dual Layer Burning, 48X CD-R Burning! 512MB buffer (under-run prevention function). It works great with the included software patches and drivers for complete compatibility with iTunes, Jaguar through Mavericks. Toast OEM for OS9 CD burning, Toast 6 Lite for OSX CD&DVD burning (you must supply your own for Lion and above). Works with iDVD and iTunes. EASILY REPLACE YOUR EXISTING INTERNAL MECHANISM. ILLUSTRATED INSTALLATION INSTRUCTIONS ON CD FOR G4 thru G5's and Mac Pro Towers INCLUDED! Room for Full Size 5-1/4" mechanism required. 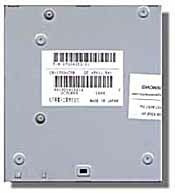 These work perfectly with your G4, G5, and Mac Pro Towers and are a great replacement for your existing CD or DVD. Apple Bootable means you can boot from the appropriate installation or recovery disks. It plays and burns up to dual layer DVD's on properly equipped Macs. DVD-ROM Access Time: 145ms, CD-ROM Access Time: 125ms. Write Speed: DVD-R: 24x, DVD-R DL: 8x, CD-R: 48x, CD-RW: 24x, DVD-RW: 6x. Speed Reading: DVD-R (SL / DL): 12x, DVD + R (SL / DL): 12x, CD-RW: 40x, DVD-RW (SL / DL): 13x CD-R: 48x. Front Panel Features: Eject Button, LED Indicator Light, Emergency Eject hole. Requires 9.1 or later and is OSX compatible. Not for G3. DVD burning in 9 and Lion and above requires your own software. Headgap Tested with OSX versions through Mavericks! One year factory warranty. SUPER SALE $59.77 includes domestic shipping. Style Evolution from Slimmer to Slimmest. Looking for a DVD burner that's portable, efficient, and doesn't require an external power supply? 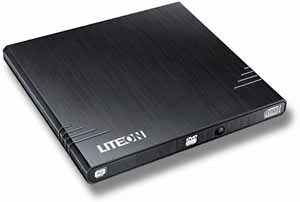 Our LiteOn UltraSlim DVD/CD Burner is just what you need. This slim and compact external DVD drive that is USB powered, so it's perfect for carrying around. Simply plug in the USB cable to your laptop or computer, and start burning through a speedy USB 2.0 interface. Playback DVD's from this unit on USB equipped TV's. Quiet Design- as a disc is being read, Silent Play technology automatically controls the disc read speed for optimal noise reduction.It writes to DVD+R and DVD-R media at 8x, DVD±R DL at 6x, and CD-R discs at 24x speeds. We include our CD with Toast Lite and other useful programs for your Mac. REQUIRES: any Mac with a free USB port and OSX. Our $49.77 price includes domestic shipping. Upgrade your 13" MacBook or 15" MacBook Pro to a DVD Burning SUPERDRIVE! 8x DVD±RW DL Super MultiDrive features a slot-loading design that perfectly complements Apple MacBooks. 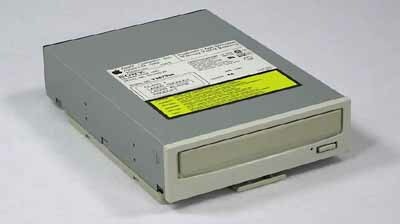 Use this Hitachi Super MultiDrive to write to DVDs at up to 8X and rewrite to DVDs at up to 4X, burn CD's up to 24X! Maximize your MacBook or MacBook Pro to its fullest potential. Includes printed instructions. This is fairly difficult to do and requires special tools. Let us install it for you, give us a call. We include our CD/DVD Utilities CD which includes burning software, utilities etc. Our $99.77 includes domestic shipping. Fully tested refurbished Apple Bootable Combo Drive! Play DVD's on your G4 Mac! Requires a ATI Rage Pro 16MB Card or Radeon 7000 for DVD playback. Make your own CD's with the include BEST BURNER SOFTWARE Toast. Great for backups! EASILY REPLACE YOUR EXISTING CD! INSTALLATION INSTRUCTIONS ON CD. We supply drivers for iTunes burning on 9.2 and X. These work perfectly with your G4 Towers and are a great replacement for your existing optical. This unit works straight up in OSX. They work in Blue and Whites. THIS IS NOT A SCSI DRIVE and requires an open spot on your IDE chain. This is not a DVD burner. It plays DVD's on properly equipped Macs (requires 16MB ATI Rage Pro Video or better). Requires 9.1 or later and is OSX compatible. Our $34.77 includes domestic shipping! Genuine Internal Apple 8X DVD-ATAPI - used, cleaned and tested pull. No compatibility issues, these are Apple brand and use the drivers included with the OS. Requires ATA systems with an open IDE port. NOT FOR SCSI machines. Great replacement for G3 & G4 systems. Improve your playback performance on earlier models! They require ATI Rage Pro Video 16MB or better and appropriate player software for DVD playback, but not required for regular data use. Was $89.77 Special $20 includes shipping. Mercury PBG4 SuperDrive for all PowerBook G4 'Ti' & 'AL' 12/15/17" Models that now have a CD-R/RW+DVD-Rom or other 'SuperDrive', iMac G5! Up to 8X DVD Burn, 3X DVD-Ram, 24X CD Burn. New w/1yr Warranty. Internal DVD RAM 2.6GB 1X - ATA Replacement - refurbished SALE $20 shipped! We're overstocked, marked way down! GREAT FOR BACKUPS! DVD RAM DISKS HOLD 2.6GB and mount on the desktop like a floppy. Media prices keep dropping. 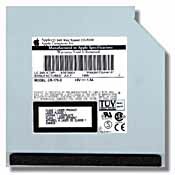 Genuine Internal Apple DVD RAM Drive DVD-ATAPI - used, cleaned and tested pull. No compatibility issues, these are Apple brand and use the disc burn and drivers included with the OS9 or later. Requires ATA systems with an open IDE port. NOT FOR SCSI machines. Great replacement for G3 Desktops and Towers and read prerecorded CD's and DVD's straight up. These work straight up with Beige G3, B&W, and G4 Towers. These use the DVD RAM media for recording up to 2.6GB per disk (or side on double sided media). Great for backup! Just plug in a cartridge, format the disk and use it like a hard drive. Low cost media available at most all office supply stores! They do require an ATI Rage Pro 16MB Card or better and the appropriate player software for DVD MOVIE playback (the card is not required for regular data useage). They also read and play CD & DVD data disks. SALE $20 includes shipping. External CD-Rom - SCSI Drive, includes power cable, scsi cable and terminator. Used tested. Internal iMac G3 Apple CD-Rom 24x - Trayload Replacement - $69.77 shipped! Internal 24X Tray Load CD-Rom. Genuine Apple Drive (no logo on item). Apple Bootable, Rev B. For Tray Loading iMac 233Mhz, 266Mhz 333Mhz. Used tested units. Perfect replacement. Lower Price $69.77 shipped. Installation instructions available on request. Internal iMac G3 Apple CD-Rom 24x - Slot Load Replacement - $49.77 shipped! Price Reduced! For iMac G3. Internal 24X Slot Load CD-Rom. Genuine Apple Drive (no logo on item). Apple Bootable, Used tested units. Perfect replacement. Was $49.77 Special $39.77 shipped. Installation instructions available on request. 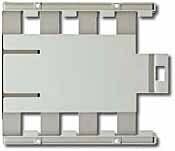 Internal iMac G3 Apple CDRW 8X/4X/24X - Slot Load Replacement - $89.77 shipped! Internal iMac G3 Apple 8X/4X/24X Slot Load CDRW. Burn CD's! Genuine Apple Drive. Apple Bootable, Used tested units. Perfect replacement. Our $89.77 includes domestic shipping. Installation instructions available on request. Limited quantities. Generic 24X (or higher) CD-R Media complete with protective paper sleeves. Brands may vary but these are the same quality CD-R's we use to produce our CD's. Pack of 10. No shipping charges with any order. SPECIAL PURCHASE - Internal CD-Rom 2x - Genuine Apple 300i SCSI - used, cleaned and tested pull. Replace that non functioning drive with a direct replacement. No compatibility issues, these are Apple brand and use the drivers included with the OS. Not for late model PowerMacs. Was $39.77 Sale $29.77 including shipping! Internal CD-Rom 1x Caddy Load - Genuine Apple SCSI - used, cleaned and tested pull. Replace that non functioning drive with a direct replacement. No compatibility issues, these are Apple brand and use the drivers included with the OS. Caddy not included, available extra. Not for late model PowerMacs. $24.77 including shipping! Internal Apple CD-Rom 4x - SCSI Replacement - $44.77 shipped! 4X SCSI Internal CD-Rom (600i) - used, cleaned and tested pull. Genuine Apple Drive! No compatibility issues, these are Apple brand and use the drivers included with the OS. Our $44.77 includes domestic shipping!